The scope of this guide is to walk a user through the required steps to perform an installation of the Outlook client for CRM. These steps cover a user installation process. 1. If Outlook is running, please close Outlook. 2. 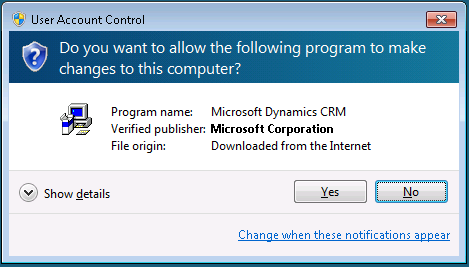 Open a new browser window and navigate to the Dynamics CRM URL as provided by your IT support group or CRM Administrator. 3. When prompted, authenticate with your credentials. You will be redirected to the current CRM organization. 4. Once the page loads, the system will recognize that the CRM client for Outlook is not installed, and will prompt you to install it. You will get a yellow band underneath the Ribbon as seen in the following screenshot. 5. 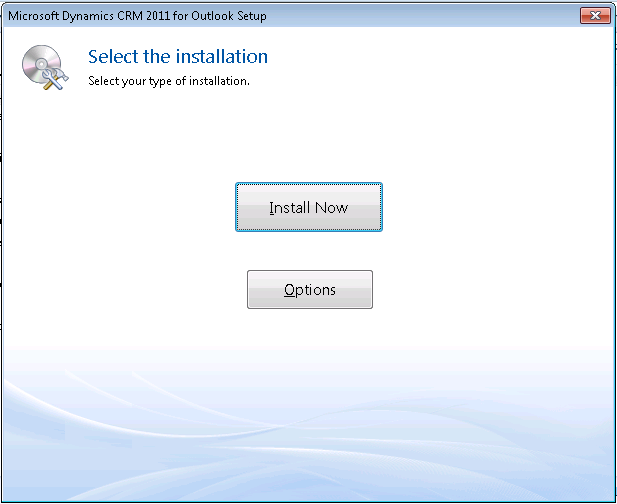 Click on the Get CRM for Outlook button. 6. The download prompt will appear. Click on the Run button. 7. 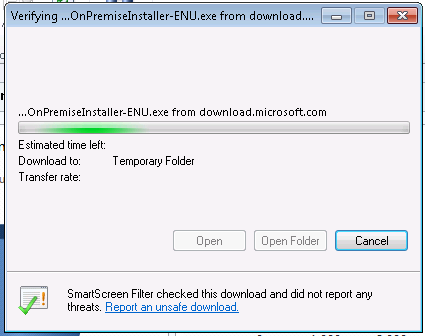 Once you click Run, the installer is downloaded, and the installation process starts. 8. 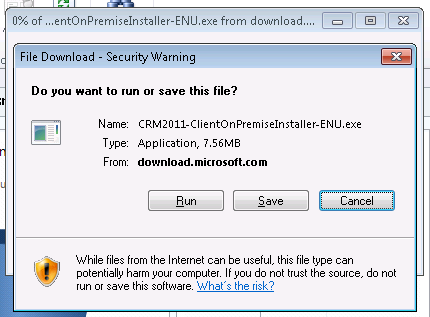 A Windows specific security feature, the User Account Control will prompt you that you are attempting to run an application downloaded from the internet, and will ask if you want to proceed. Click Yes. 9. The Setup process begins by preparing the necessary files for the installation. This might take a while, depending on the local machine specifications and the internet connection speed. 10. The Agreement screen is displayed. 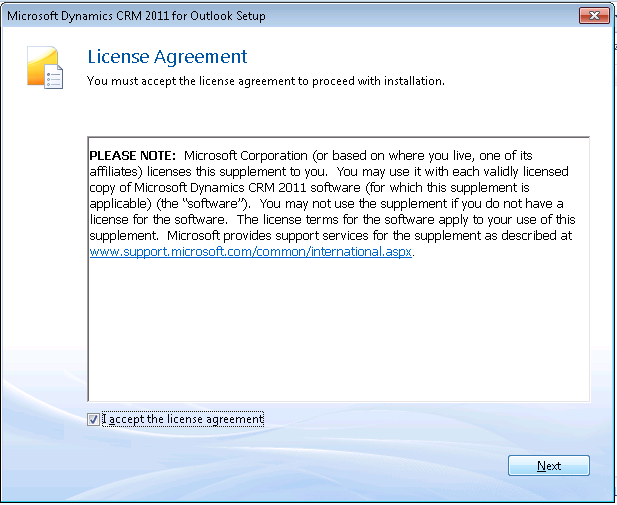 Select the “I accept the license agreement” check box, and click on Next. 11. 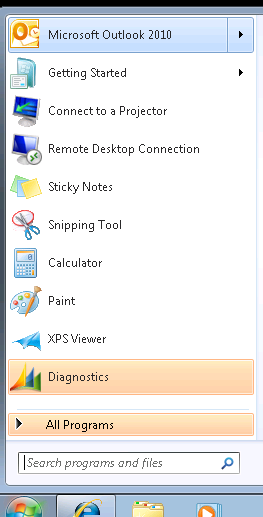 On the following screen, click on the Install Now button. 12. The installation process has started. The progress bar will show you the actual installation progress, with an update of the tasks that are being completed. Wait for the installation to complete. 13. At this point, the installation has completed. Click on Close to finish the installation process. 14. 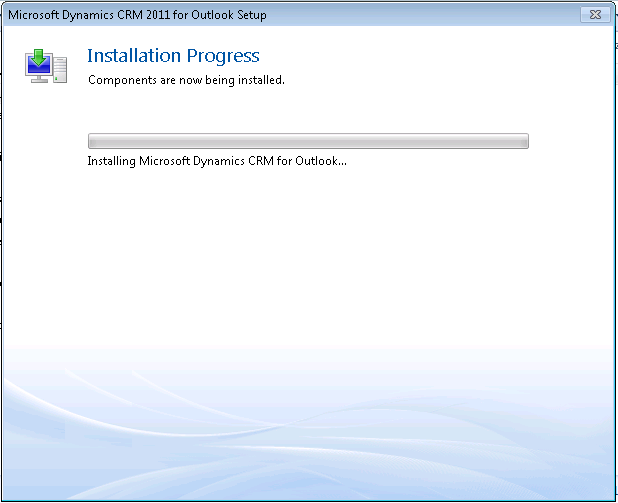 At this point, the CRM client for Outlook is installed. Go ahead and launch Outlook. 15. 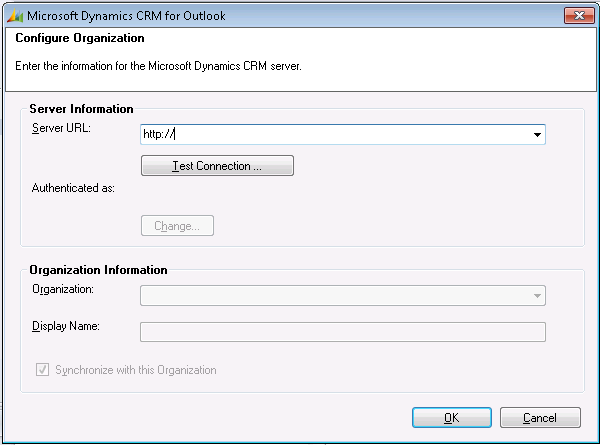 First time you launch Outlook after the CRM client installation, you will be prompted to configure the client, by pointing it to the address of your Dynamics CRM server, as well as defining the Organization you will be using. 16. Please enter the same URL you have put in the browser at step 2. Click on Test Connection. 17. Once the connection is validated, in the Organization Information area, the Organization drop-down becomes active, and the default Organization becomes the default selection. Also, the Display Name field is populated to reflect the default Organization selected. 18. If there are any issues testing the connection, or the default Organization is not being recognized, please contact your IT support personnel or your CRM administrator for assistance. 19. Once this configuration is complete, click OK.
20. The Add Organization process screen is displayed shortly, and once the process completes, you are being returned to your Outlook application. 22. 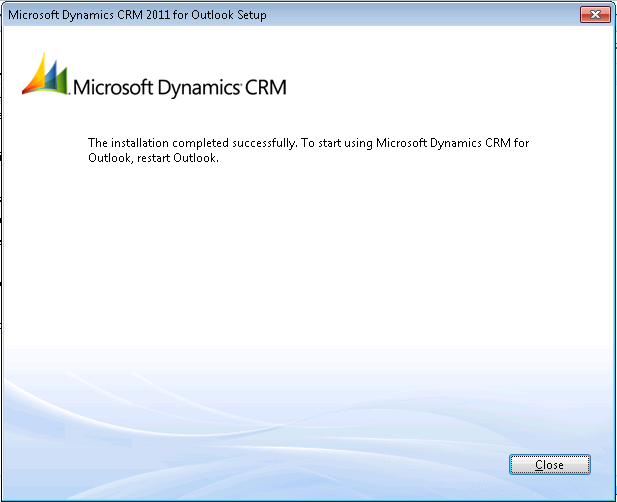 Congratulations, your CRM connector for Outlook is installed and configured. 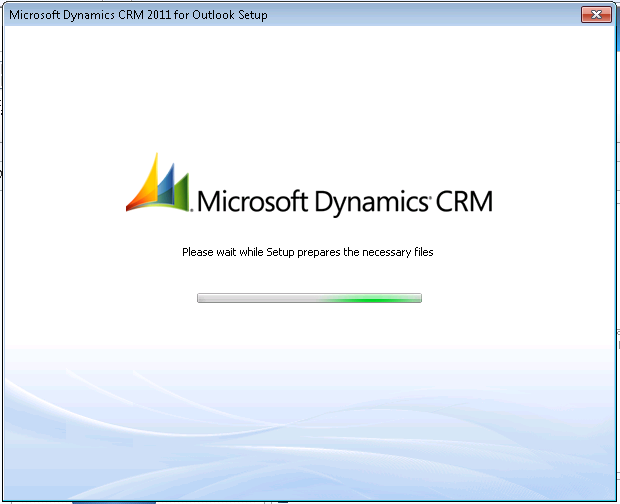 Now you are ready to use your Dynamics CRM Organization by using the same familiar interface of Outlook.